Great Moments In Advertising: Drumsticks For The Masses! I’m waiting for one to hit the Empire State Building. Cashier: Tsunamis don’t get that big. Customer: Yes they do. The biggest one ever was 500 times taller than the Empire State Building! That’s pretty damned high, gentle readers. Then again, so was this guy. In all seriousness, bodega banter might be good for a chuckle but what is happening in Japan most decidedly is not. For this reason I encourage those of you who are able (Hey, I know times are tough) to make a donation to the Red Cross. This can be done by clicking here. Thanks! 4 Comments on Great Moments In Advertising: Drumsticks For The Masses! “Epic win” is an overused phrase, but that sign–and your photo thereof–is full of epic win. It makes me think of that part in “Independence Day” when the people all gather to see the alien motherships land, and they’re looking up all happy, but instead of nice stuff and puppies and whatnot, death rays spew forth, destroying them all. 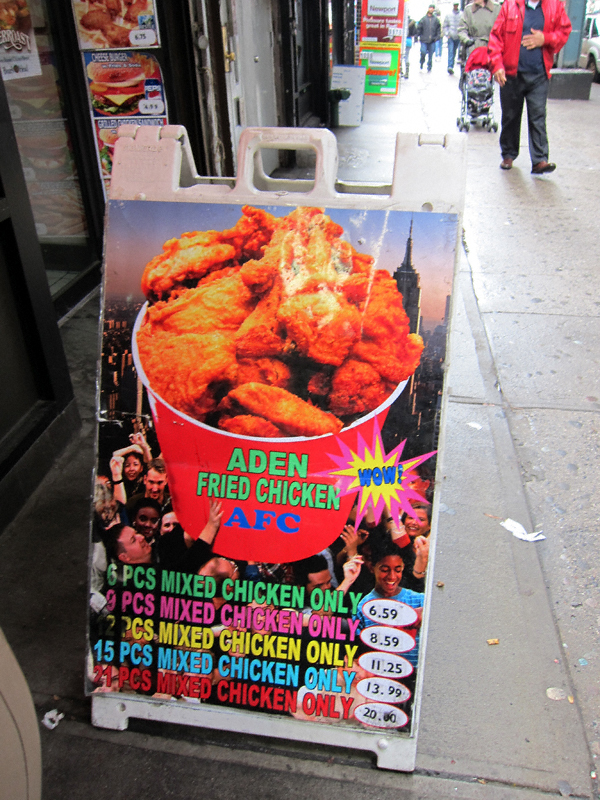 Imagine if it had been buckets of fried chicken instead of death rays? Or imagine if in “Tommy” when Ann Margret smashes the television set with a champagne bottle chicken nuggets and assorted dipping sauces came out? And she straddled a big drum stick! Made me think of Bobby Moynihan’s character Anthony Crispino on SNL who relays second-hand ‘news’ that always ends up as outlandish, exaggerated tall tales full of misinformation which he believes to be unequivocally true. There seems to be no shortage of such people in Brooklyn and/or NYC in general (at least in my experience). Not 500x as tall as the empire state, but frighteningly they can get AS tall as the empire state. See http://en.wikipedia.org/wiki/1958_Lituya_Bay_megatsunami where damage was measured 1,720 feet up. Insane.